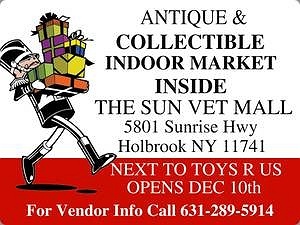 Subject: LongIsland.com - Your Name sent you Event details of "Antique & Collectibles Market"
Come on over to a new antique and collectibles market starting this Saturday, Dec. 10, 2016. There will be many booths of great collectible gift items such as: vintage/newer toys, games, dolls, sports cards/memorabilia, comics, action figures (Star Wars, Star Trek, DC/Marvel, etc), POP Vinyl figures, Barbie, MLP, Ninja Turtles, Disney collectibles, and much more! Visit the MILO TOYS & COLLECTABLES booth on Saturday (located on the west wall 3rd booth down the aisle) for a free prize just for coming down (see Mike or Lauren). We look forward to your patronage this holiday season -you'll find great deals for you and your loved ones!